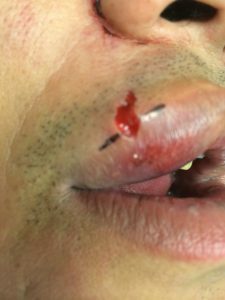 We all know the importance of lining up the two sides of a laceration that goes through the vermillion border of a lip laceration. Injecting lidocaine or swelling from the trauma itself can make this difficult. Use a skin marker to outline the the vermillion border on each side, making this easier.